Before we start, I would like to inform everyone that Bloggers Tech is now an affiliate of Apple but I'm just affiliated with their apps and not the whole Apple store. So yes, they're not hosting or sponsoring the iPad giveaways. But then nothing's gonna stop me on letting you guys avail the Apple iPad here at Bloggers Tech and have the iPad best buy now. As of now I only have the Amazon store for Bloggers Tech, I don't like the current Apple's third party affiliate program for the Apple store. Below is the amazon store of Bloggers Tech, first generation of iPad to the new iPad is available. I didn't include the iPad with a network (AT&T and Verizon) but you could make a request and let me know if you prefer to include that too. It will be really great if you could buy iPad through Bloggers Tech because you could help me in maintaining and keeping this blog alive. Keep doing what I am doing now and sharing some tips, tricks, information and news. So if you're planning to buy an ipad, then have the best buy iPad here at Bloggers Tech! But to help you decide and know the difference among the Apple iPad released here's an informative and helpful infographic on the Apple iPad. 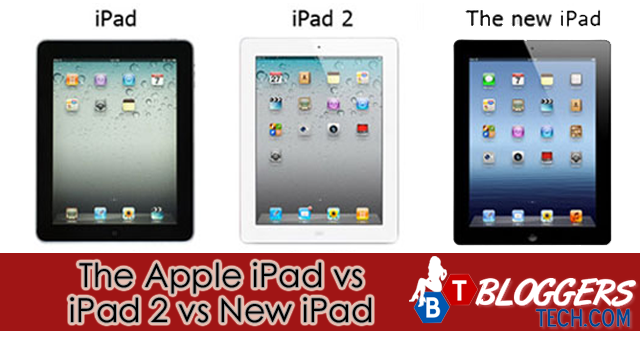 Below you'll find the comparison on the iPad First Gen, iPad 2, the New iPad also known as the iPad 3. So I hope this will enlighten you all about the Apple iPad and get the best buy iPad gadget! I don't have my own Apple iPad yet, even just the first gen Ipad, or the iPad 2 or the new iPad 3 because it's really expensive and I want to have the best buy iPad price I could grab. Though some of you may say it's not that expensive, it's expensive $300 in my country could already pay one semester for college, or pay all my monthly bills and groceries. So rather than buying iPad, I go for keeping it for any emergencies and paying bills. For those who have used the Bloggers Tech iPad Store above, thank you so much for grabbing the iPad best buy price through us. Do you already have the new iPad or are you still in the first gen iPad? How useful the iPad for you? Share your thoughts and cheers!